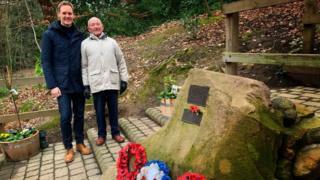 A fly-past to mark the anniversary of a fatal plane crash in a Sheffield park will take place after a campaign led by BBC Breakfast presenter Dan Walker. The US bomber - a B-17 Flying Fortress known as Mi Amigo - came down in Endcliffe Park, Sheffield, in 1944 killing all 10 airmen on board. The campaign began after Mr Walker met Tony Foulds, who witnessed the crash and regularly tends to the memorial. The US Air Force will carry out a fly-past on the anniversary on 22 February. Crews will set off in an F-15 fighter jet from RAF Lakenheath in Suffolk, home to the largest US Air Force camp in the UK. US and UK aircraft including Ospreys, Typhoons and a Dakota will also take part. Mr Foulds was playing in Endcliffe Park aged eight when he saw the plane come down. He said he felt responsible, because the plane was trying to avoid crashing into him. Referring to his visits to the memorial, he said: "They are my family. I love them to pieces. "If I go on holiday I always make sure my son goes to visit. I always tell them how I am, what I'm doing, what the weather's like." Dan Walker met Mr Foulds when he was walking his dog in the park in Sheffield, and became interested in his story. He shared Mr Foulds' plight in a tweet which has now been liked more than 27,000 times. The US ambassador to the UK, Woody Johnson, said: "It takes amazing people to have an amazing moment. "I am so happy you did this because now, millions of people know about these 10 men, and all the other men that died on that day too."